We seem far from the official start of spring here in north Alabama, even though it’s only a month away and temperatures are mild in the last several days. This has been a relatively rough winter at times, especially compared to the almost non-existent winter weather of 2016-2017. Today, however, in mid-February, the temperatures are in the 70s and I couldn’t help but get giddy for the return of warm and hot weather as the norm – a giddiness that always kicks in once Mardi Gras has passed. This feeling has been coming for days now and I have noted the hopeful signs in my own winter- ravaged yard, which has become a little spongy after a spate of hard rains. Even so, there are harbingers of spring popping up daily and everywhere if you pay attention. Spunky robins are lurking around the back yard in growing numbers and daffodils are abundant in nearby yards. 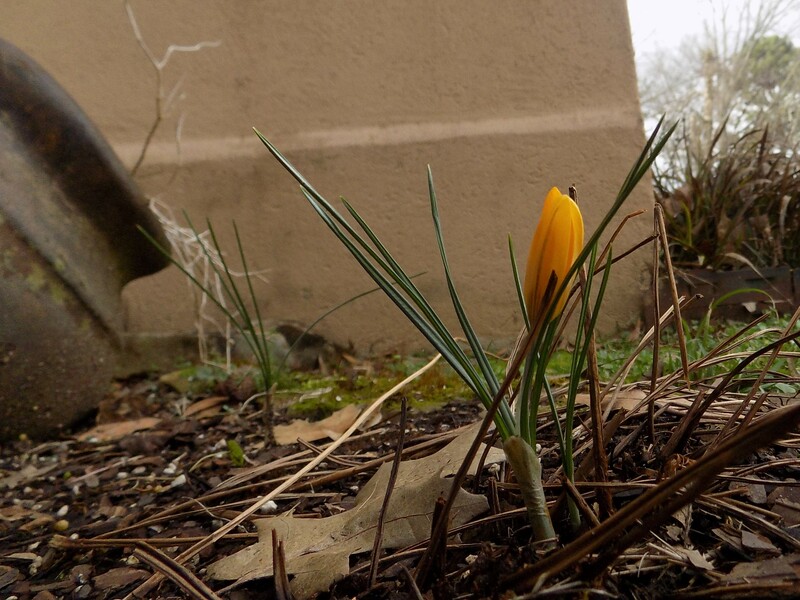 In my own little front yard this week, I spotted a single blooming crocus and a bunch of crocus foliage that clearly has no plans to bloom this year. When I moved into my house eight years ago, I randomly planted sixty crocus bulbs around the front yard. In the first couple of years after planting, the tiny flowers would appear in profusion around the yard. I haven’t had time to maintain the yard as carefully as I used to and the crocus attrition rate has accelerated, but the few hardy plants that persist are a tiny little pleasure to discover as February hurries through. The cherry tree in my front yard always puts on a grand show for a couple of weeks in early spring. We’ll have to see how it fares this time around since it underwent a pretty extreme pruning in the fall. In the meantime, my neighbor’s back yard cherry tree, which continues to grow unfettered and provides a significant canopy in my own yard, usually blooms a few weeks earlier than my cherry tree and will hopefully once again provide a magnificent borrowed view out the back windows. It is normal for my cherry tree to burst forth with blossoms just as the neighbor’s cherry blossoms are giving way to lush green foliage. 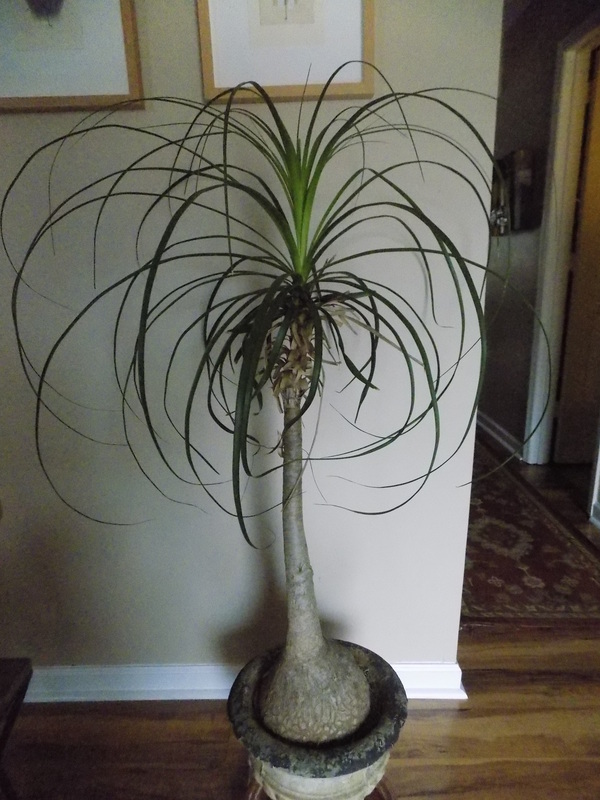 A ponytail palm that has been with me for twenty years now, flourishing in a cramped concrete planter that belonged to my Grandfather Harbison, seemed to bite the dust when I had prematurely moved it outside before the freeze last year; by mid-summer it had sprouted new ribbons of leaves and again graces my living room as beautifully as ever. I plan to wait longer this year before I put it outside the front door as a welcoming beacon. In the back yard, the pots that held herbs in the 2017 growing season are sitting on a garden table outside my library window, waiting to be replanted. I usually have pots of mint and rosemary, thyme, parsley, oregano, and basil – lots of basil. This week, chives began to push up in one of the pots and I wonder what other volunteers might reappear. 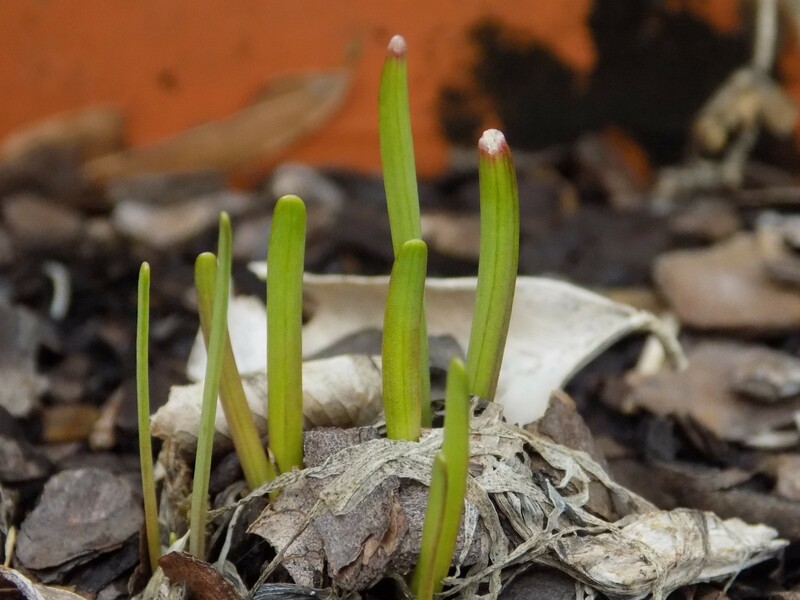 Many plants that began to flourish early last spring were killed off by that unexpected hard freeze in April while others eventually came back, a little worse for wear, and still others re-emerged better than ever. 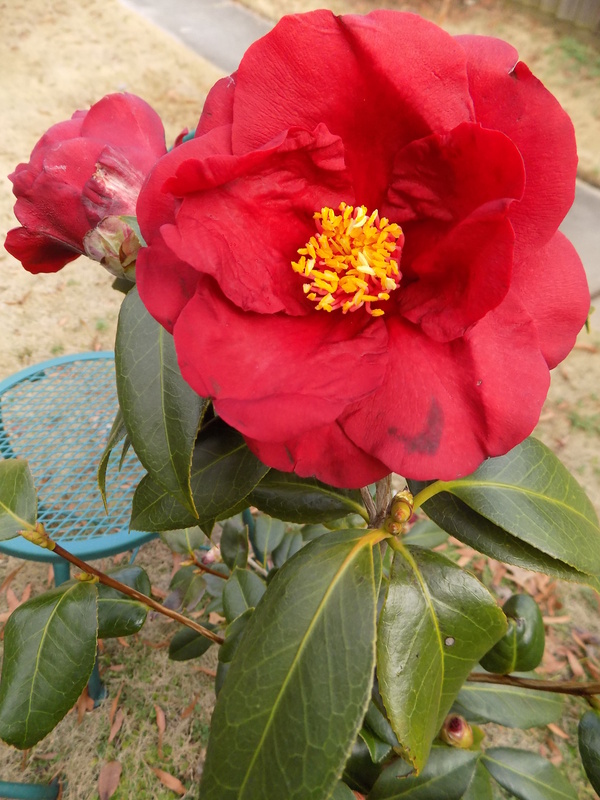 The deep red camellia bush that replaces the tall 35-year-old Rose of Sharon that died last year is all abloom and I look forward to its off-season blooms and its evergreen presence just inside the back gate for this and years to come. The four potted crape myrtles just outside my back door always take their sweet time to get going, but they look healthy and I’m sure they’ll provide profuse color by mid-summer. Outside the back gate, the potted wild rose that was foraged from a lakeside in Owens Cross Roads over in the Flint River Valley is already sprouting – as eager as I to get the warm weather underway. Tulips that were left by the previous owner of my house are coming up but they don’t always bloom and I’ll be curious to see what they do this time around. 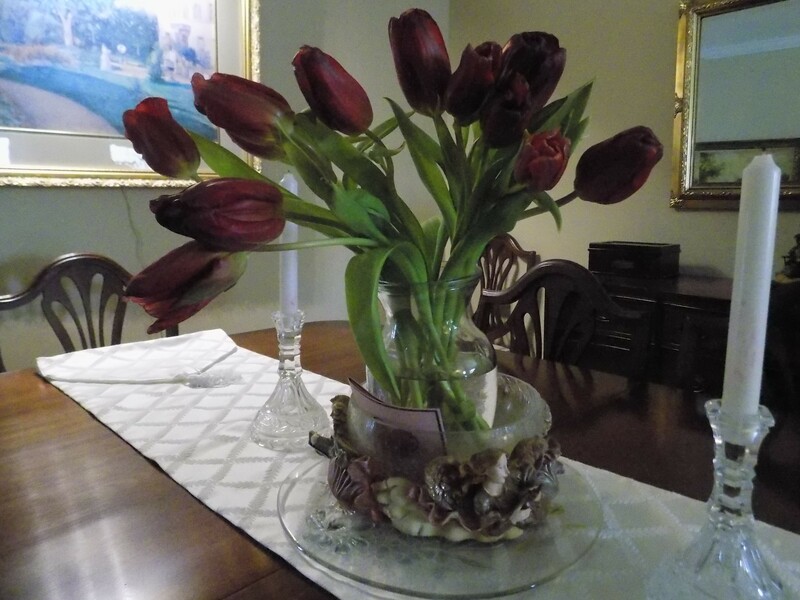 At my mother’s house in Birmingham this week, I was greeted by a vase of burgundy tulips on the dining room table. These are just another temptation to make me long for spring to set in for a spell. I have a list on my refrigerator of things I want to do in my backyard garden and I wonder how much of the list I might be able to tackle this year. In the library hangs a sketch, drawn by my nephew when he was about six or seven, of a plan for my back yard garden that includes specific spots for sitting areas and plantings, a grill, and a large central fountain. I regularly consult that sketch to see how it connects with my own plans. In lieu of the fountain, I may move the birdbath from the front yard to the back. It was originally placed to cover a bare spot in front of the window but that bare spot is now lush with plantings and the birdbath has gotten lost from view. The yard is a constant work in progress with no master plan. Every warm evening that I sit at the bistro table in the rear of the little yard the list changes and I know the plan, like nature’s own evolution, will never reach completion. This entry was posted in spring gardening and tagged Alabama, Alabama gardening, suburban gardening on February 17, 2018 by gedwardjourney.